History: Jonathan Wraith was born, bred, and indoctrinated into the authoritative world of the miliary. There is little distinction between his childhood and his adulthood in that both have been spent primarily on military bases. His father was a distinguished naval commander who operated pimarily out of Norfolk, Virgainia. This is where Jonathan was born and where he spent the majority of his early life. His father ran his family the same way he ran his unit, utilizing a harsh form of discipline and order. His mother and siblings lived under an iron fist and were subject to harsh rules. They were expected to have breakfast at a certain time, they were expected to be well-dressed and ready for school on time, and they were expected to have all their work done. For some this life was too harsh. Wraith's mother left when he was nine-years-old and his oldest brother ran away at age 16 only to fall into a life of crime and substance abuse. His other siblings, including two sisters and a younger brother, were more deeply affected and came to resent the authoritarian world they grew up in. They didn't run away, but their lack of support limited their success. For Johnathan, however, he never deviated from his father's path and in that way he became the favored child. His father dedicated more time to him than almost anyone else in the family and he set his son's path for years to come. Throughout his teenage years, John Wraith stayed straight and true to his father's guidance and graduated from a small military academy a full year ahead of his class. He then enrolled in West Point where he endured far more hardship. Being away from his father's authority was so unfamiliar that he never got entirely comfortable. Not wanting to disappoint his father, he fought hard to stay on course. This earned him a reputation of being ill-tempered, violent, and egotistical amongst his peers. Even some of his teachers found his attitude off-putting and he became somewhat a pariah. To make matters worse, his father was killed overseas at this time while on a mysterious operation from which John would never learn the details. This affected him a great deal, turning him into a much more focused and determined soldier. The last two years at West Point helped him excel and while he only graduated in the middle portion of his class, the stage was set for him to follow in his father's footsteps. John Wraith would enter the military during the height of the Cold War, quickly gaining the rank of Major. However, his aspiring military career stalled in wake of the chaos and politics of the era. Since he lacked the high marks of his superiors, he sought another way to pave his way through the ranks. He found his ticket in the form of a then obscure scientist named Doctor Abraham Cornelius. As part of the many black projects fighting for funding, Cornelius was part of an up and coming program called Weapon X. The program had just gotten approval and was in need of an officer to run it. Since Cornelius needed order, Wraith fit the mold perfectly. He soon saw a great deal of potential in the program. The idea of using mind-controlled mutants to carry out operations and impose order appealed to the authority figure in him. He ended up being the one that brought the mysterious men known as Logan and Victor Creed into the program. Using connections from his father's people along with an unexpected tip from Victor Creed, he captured Logan and later betrayed Creed so Cornelius could use them in Weapon X. 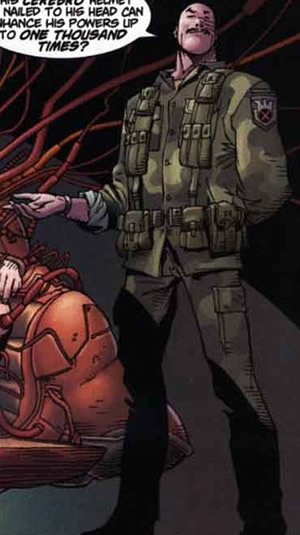 This initial success earned Wraith the rank of Colonel and under his leadership, Weapon X was set up in record time and under the strongest of secrecy. Many facts about Wraith's activities during this time are not known, but he distinguished himself by putting together some of the first units specifically trained to handle dangerous mutants. This helped keep Weapon X progressing until the fateful day of the final experiment. Despite Dr. Cornelius's confidence, he was unable to control the weapons he created. Wolverine and Sabretooth both went rogue and the program was in jeopardy. Rather than this being a blemish on his career, Wraith turned it into an opportunity. He used the events of this program to prove to his superiors that mutants were a potential enemy every bit as dangerous as the Soviet Union. As a result he attained the rank of General and would spend the next few decades paving the way for the government's involvement in mutant affairs. He put together rigorous training programs that helped soldiers and authority figures around the world take on mutants. As mutants became more mainstream, his services became more important. When the opportunity came to finish what they started with Weapon X, General Wraith jumped at the chance. In an operation steeped in secrecy, he was able to recapture Wolverine a second time. During this second attempt, they succeeded at making him a mindless weapon. For General Wraith it was a potential career maker. He became the front-runner to lead the first unit of Weapon X into battle. However, he once again overestimated Dr. Cornelius. His control over Wolverine was shattered again and Wolverine escaped. This time he could not turn failure into opportunity. His once promising career stagnated and stayed stagnant for many years after that. Despite the failures of Weapon X, he remained a high ranking officer. When the opportunity to take on Weapon X again came along, he embraced it albeit reluctantly. This led him to cross paths with the X-men, a team of mutants that stand in oppposition to his agenda. Their efforts have only emboldened his determination to assert order in the world. His success and failure as an officer remains tied to Weapon X and like his father before him, he has no desire to let chaos reign. Character Breakdown: John Wraith's personality is driven by order. He grew up in a world that was strictly controlled by his father. Anything that deviated from the rules and regulations that governed his life was deemed bad and it gives him a very black-and-white view of reality. Psychologically, he is someone who has a deep need to control the world around him and maintain order in a chaotic environment. He's seen the consequences of those who break the rules. His mother ran away and his other siblings couldn't take it. They struck out on their own and weren't a success. That instilled in Wraith a kind of proof that vindicated his father's iron fist. It may have been harsh, but it worked. John carried on this tradition and came to embrace this authoritarian view of the world. In his mind nothing is above law and order. There needs to be some regulating force to instill discipline on the chaotic masses. This mindset is part of what helped him excel in the military. He may not have had the most tactical brilliance an officer can have, but he has the drive and ruthlessness to achieve his goals. It is a somewhat dangerous minset because it opens the door for having a tyranical and abusive personality. It is the kind of personality that can foster narcisissm and a lack of empathy. What keeps John Wraith from walking this path is discipline. He takes the responsibilities of an officer very seriously. He is humble enough to understand that he is also not above law and order and does not make exceptions for himself the way some other authority figures might. He saw his father succumb to his limits and that's part of what keeps him in check. In addition to those limits he imposes on himeslf, he naturally sees the greater limits of mutants as a major threat. In a ways mutation is the very embodiment of everything he's against. They're the product of random accidents in the genetic code and those accidents to him are the same as chaos. Because individuals are behind these powers and these individuals are subject to law and order, they cannot be allowed to rise above the rest of society. This is why he has so little problem putting mutants through Weapon X. In his eyes it's not an inhumane act. To him he's taking mutants and using them to uphold the law and order that he believes to be so sacred. In his mind if mutants were just allowed to act on their own accord as the X-men do, then that's just going to lead to more chaos and disorder. Since much of his life is tied to Weapon X and controlling mutants, his personality and psychology are almost dependant on this conflict and he will not consider his mission a success until he can subject law and order onto everyone.